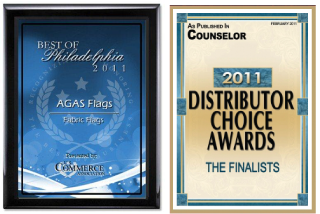 AGAS is a leading manufacturer of flags, banners, and promotional products. Our company was founded in 2000 in Philadelphia, Pennsylvania where we have our headquarters, main flag factory, and warehouse. We distribute flags, banners, and promotional products to wholesalers, distributors, retail chains and other businesses across the United States and around the world. Our online flag catalog is available for direct customers to purchase quality flags, banners, and promotional products at the same low prices given to our business customers. Additionally, if you're looking for custom flags, we have a talented team of graphic designers who can make your wildest sign dreams come true! Contact us at sales@agasmfg.com to consult with a dedicated sales representative who can help you with choosing the perfect flag, banner or product, pricing, and order placement. Our mission is simple - to provide the best promotional products and service to our customers at the lowest prices possible. We take great pride in our company, our commitment to customer service, and in the products we sell. Your satisfaction is our number one priority. Please contact us with any questions or comments at 1 (866) 269-3524 or sales@agasmfg.com.